The exploration of Mars over the past decade has focused on finding evidence for water-rich paleo-environments and implications for habitability. Understanding the lateral and vertical distribution of hydrous minerals on Mars is important, because hydrous minerals in the ancient rocks record environmental conditions in which they formed and the stratigraphy (i.e., sequence) of these minerals reveals how environments evolved over time. Much of my Ph.D. work has focused on spectroscopic and stratigraphic mapping of hydrous minerals in Aram Chaos and Melas Chasma on Mars using a variety of Mars orbital remote sensing data sets [1, 2, 3]. Currently I continue to pursue studying hydrated minerals on Mars and understand their implications for paleo-environments, exploring the geology of possible habitable sites, and seeking signs of past life. UV reflectance spectroscopy is a historically untapped technique for studying airless planetary surfaces. The Lunar Reconnaissance Orbiter (LRO) Lyman Alpha Mapping Project (LAMP) provides complementary spectral measurements of lunar surface at far-ultraviolet (FUV) wavelengths. As a co-investigator on LAMP team, my research interests include: (1) photometrical modeling of lunar surface at FUV wavelengths ; (2) FUV characteristics of the new impact craters identified by LROC to better understand impact processes on the Moon ; (3) FUV investigation of the cold spots on the Moon identified by Diviner instrument to understand the rate of optical maturity on the Moon ; and (4) examining FUV observations towards assessing space weathering effects on lunar pole- and equator-facing slopes, to understand which processes (i.e., solar wind implantation vs. micrometeoroids bombardment) play main roles in space weathering on the Moon . One fundamental challenge and important aspect of planetary remote sensing analysis is accurately estimating mineral abundances from VNIR data. The spectral unmixing of VNIR data is highly nonlinear which sometimes causes large errors in the modeling. To perform quantitative mineralogical analysis of Mars, the Discrete Ordinate Radiative Transfer (DISORT) model is used to retrieve the single-scattering albedos, by assuming that surface scattering can be modeled using the Hapke bidirectional reflectance distribution function (BRDF) . Because the single-scattering albedos approximately add linearly, this method allows for linearly unmixing of the VNIR data and thus greatly improves the accuracy of mineral abundance models. Using the technique we developed previously , the mineral abundances and grain sizes can be derived from CRISM data over the regions of interest and then be used to constrain the formation mechanism of the minerals on Mars. Many diverse observations suggest that not only does the Moon possess extensive reservoirs of volatiles that are concentrated in the polar regions, but that the volatiles exhibit abundance variations as a function of latitude and time. The LRO LAMP FUV data can be used to estimate the abundance and distribution of lunar water. The approach is to use the optical constants for Apollo soils and water frost as inputs to Hapke's intimate mixture model to generate synthetic spectra using radiative transfer theory to best match LAMP albedo. The optical constants of endmember species, i.e., lunar soil and water ice, can be modeled using the FUV spectra acquired by the Southwest Ultraviolet Reflectance Chamber (SwURC) instrument at Southwest Research Institute (SwRI). The best-fit relative weight of the water frost will yield the spatial distribution of the surficial water. 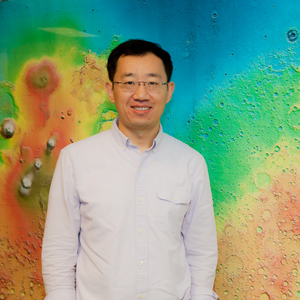 The project will be led by Ujjwal Raut at SwRI, and Dr. Liu will be a co-I on the project. Laboratory spectroscopy allows us to examine geologic materials similar to those that are present on planetary surfaces such as Mars and the Moon. The laboratory spectroscopic measurements and studies of reflectance spectra from FUV to VNIR [7, 8, 9, 10], can help understand the variation in spectral characteristics of samples of differing mineralogies, particle sizes, temperature and pH conditions, and shock levels, and thus to better interpret remote sensing data from Mars, the Moon, and asteroids. Another important task in this research theme is to perform laboratory testing to determine the accuracy and inclination of spectral unmixing model. Using the similar approach we developed previously [6, 11], unmixing the spectra of the mixtures acquired in the laboratory can be performed. By comparing the model abundances with prior-known abundance in a mixture, one can determine the errors in spectral unmixing modeling. This research is vital to constrain the model accuracy of the spectral unmixing of the remote sensing data. Liu, Y., et al. (2012), Lambert albedo retrieval and analyses over Aram Chaos from OMEGA hyperspectral imaging data, J. Geophys. Res., 117, E00J11, doi:10.1029/2012JE004056. Liu, Y. and Catalano, J.G. (2016), Implications for the aqueous history of southwest Melas Chasma as revealed by interbedded hydrated sulfates and Fe/Mg smectites. Icarus 271, 283-291. doi: 10.1016/j.icarus.2016.02.015. Liu, Y., et al. (2017), Spectral and stratigraphic mapping of hydrated minerals associated with interior layered deposits near the southern wall of Melas Chasma, Mars. Icarus, https://doi.org/10.1016/j.icarus.2017.11.006. Liu, Y., K. D. Retherford, T. K. Greathouse, U. Raut, A. R. Hendrix, K. E. Mandt, G. R. Gladstone, J. T. Cahill, A. F. Egan, D. E. Kaufmann, C. Grava, W. R. Pryor et al. (2018), The wavelength dependence of lunar phase curve as seen by LRO LAMP, J. Geophys. Res. Planets, in revision. Y. Liu, K. D. Retherford, T. K. Greathouse, K. E. Mandt, J. T. S. Cahill, A. R. Hendrix, U. Raut, C. Grava, D. M. Hurley, B. Byron, L. O. Magana, A. F. Egan, D. E. Kaufmann, C. Grava, G. R. Gladstone, W. R. Pryor, LRO LAMP Photometric Corrections and Far-UV Investigations of New Impact Craters, Cold Spots, and Space Weathering on the Moon, New Views of the Moon 2 – Asia, The University of Aizu, Japan, April 18-20, 2018. Liu, Y., et al. (2016), End-member identification and spectral mixture analysis of CRISM hyperspectral data: a case study on southwest Melas Chasma, Mars. J. Geophys. Res. Planets 121, 2004–2036. doi: 10.1002/2016JE005028 . Liu, Y., and A. Wang (2015), Dehydration of Na-jarosite, ferricopiapite, and rhomboclase at temperatures of 50 °C and 95 °C: Implications for Martian ferric sulfatesaccepted by, J. Raman Spectrosc., doi:10.1002/jrs.4655. Wang, A., B. L. Jolliff, Y. Liu, and K. Connor (2016), Setting constraints on the nature and origin of the two major hydrous sulfates on Mars: Monohydrated and polyhydrated sulfates, J. Geophys. Res. Planets, 121, doi:10.1002/2015JE004889. Scudder N. A., T. D. Glotch, Y. Liu, T. Condus (2015), Hapke-Based Linear Spectral Unmixing of CRISM Single Scattering Albedo Data, Lunar and Planetary Science Conference 46, abstract # 2977, the Woodlands, TX.